Holiday season, with large dinners, rich desserts and drinks, is upon us. 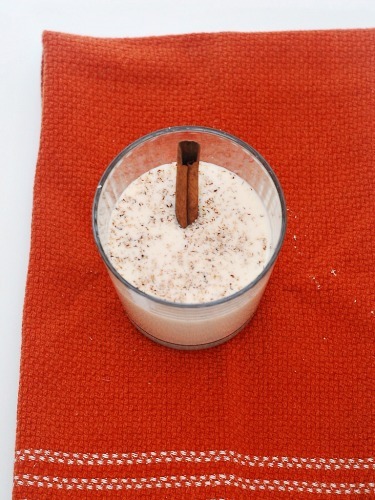 Save calories without sacrificing flavor with this lightened-up eggnog! It’s here: holiday season. Halloween candy, Thanksgiving dinner, cookie swaps, Christmas parties … Eating healthy? See you after New Year’s! But wait! Today’s #SundaySupper is all about lightening up holiday food. One of my favorite holiday indulgences is egg nog. It’s basically a custard (meaning lots of whole milk, cream, sugar and eggs), flavored with nutmeg and alcohol, usually brandy or rum. One 8-ounce cup can set you back 225 to almost 350 calories! The lightened-up eggnog still has dairy, and it still has eggs. But I used fat-free half-and-half and fat-free sweetened condensed milk. The condensed milk, along with a small spoonful of flour, helps thicken up the mixture, so we can use fewer (calorie-heavy) egg yolks. Since the condensed milk is sweetened, we don’t need additional sugar. In the end, it’s about half the calories of full-fat eggnog. This mixture isn’t quite as thick as the full-fat version. But the flavor is definitely there. We also save some extra calories by pouring a 6-ounce cup instead of an 8-ounce cup. If you want to make this recipe kid-friendly (without the alcohol), you can replace the brandy with 3/4 of a teaspoon of brandy or rum extract. Place the half-and-half, condensed milk, flour, nutmeg, cinnamon and salt in a medium, heavy-bottomed saucepan over medium-high heat. Whisk constantly until the mixture comes to a boil. 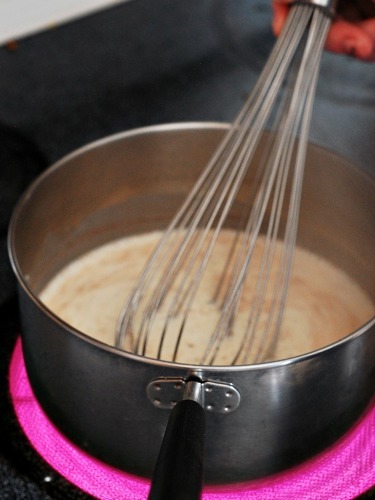 Once the dairy mixture boils, gradually pour about a third of the mixture over the egg yolk, whisking constantly. Once fully whisked, pour the egg/dairy mixture back into the saucepan and return to the heat. Whisk until the mixture boils again, and cook for a minute. If the mixture bubbles up to the top of the saucepan, briefly pull it off the burner so it doesn't bubble over. You may need to do this a few times. After it cooks for a minute, pour the eggnog into a pitcher or tall container. Stir in the brandy or rum and the vanilla. Let cool at room temperature for about half an hour, then place in the refrigerator for at least 4 hours, or overnight. Pour 6 ounces into a mug or glass, garnish with a little freshly grated nutmeg and serve. Nutrition data calculated with MyFitnessPal recipe calculator. Don’t forget to check the other #SundaySupper lightened-up holiday recipes! Everyone needs this recipe!! Thanks for lightening up this classic! That looks so good, I would have one of these over the original for sure!! I love condensed milk and finding new uses for it. This looks so good and what a great alternative to store bought eggnog. Ooh, I adore eggnog – will try this next month! Awesome! I love eggnog but stay away from it because of how fattening it is!! Thanks for giving it back to me!! The fat-free condensed milk isn’t available where I live but I just happen to have a can in my kitchen cupboard that my sister arrived with when she visited. Yeah, we travel with strange food items. This sounds wonderful, Coleen! 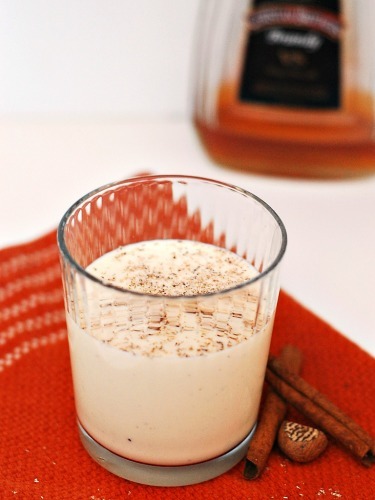 Pinned for the upcoming holidays…hubby LOVES eggnog, but it’s such a calorie bomb. Good to know I can make it a bit less fattening for him! I love eggnog. I never thought of making it at home and low fat. I’m definitely trying this for our holiday party! My stepfamily would adore this, they mow through so much eggnog through the season! Perfect timing for this one! I love eggnog and start to break it out in a couple more weeks. Thanks for this lightened version!! My husband loves eggnog and I’ve been looking for a way to lighten it up for him. I’m definitely trying this recipe! I love the taste of eggnog but HATE how insanely fattening it is for you. This lighter version is great! I was so excited to see your recipe! I adore eggnog, but the calories… yikes!! This looks like a wonderful substitute for much less guilt. I am so making our own eggnog this year. I absolutely fell in love with brandy when I made tiramisu last year for the holidays. Looks and sounds delicious. I love that you used sweetened condensed milk. Now I’m ready for eggnog season! Golly I love eggnog. But I don’t allow myself to have hardly any. Sniff. BUT this may change things! Thank you! Well done! This will be a nice treat for my husband, who loves eggnog!